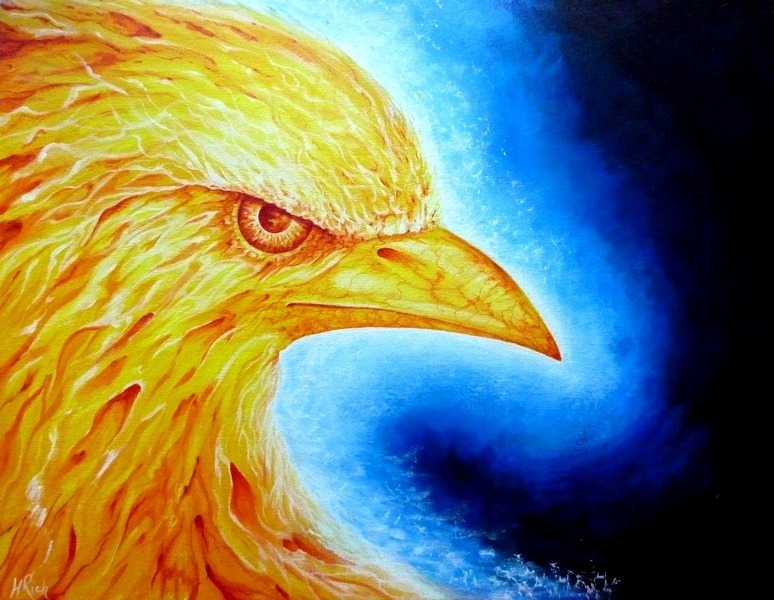 The legendary Phoenix, consumed by fire and reborn from the ashes. A fitting start for a new series of paintings for 2019 – Birds of Myth and Legend. Acrylic on Board, 18inches x 14inches. Prints will be available soon. 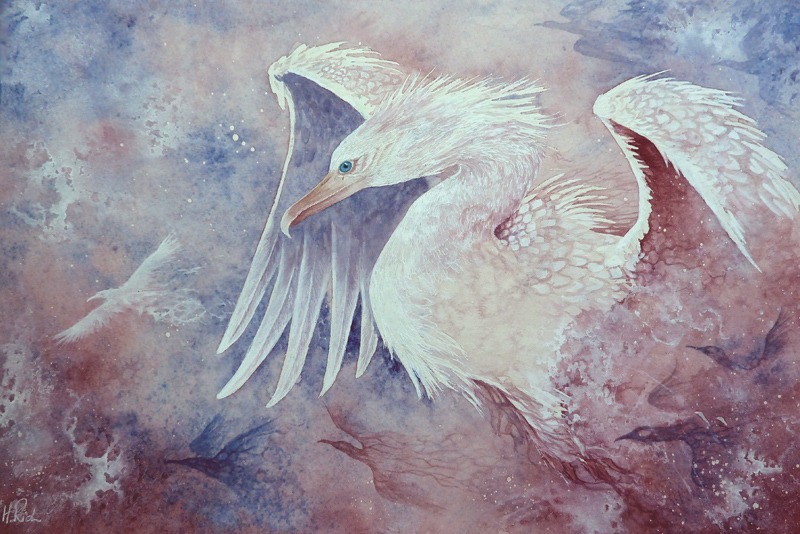 This entry was posted in Birds, Buy Original Artwork and tagged acrylic, bird art, birds of myth and legend, fantasy art, phoenix on February 12, 2019 by Helen Frost Rich. My extreme close up portraits cut out any distractions, giving the viewer an intimate study of the creature portrayed. My Snowy Owl portrait captures the full intensity of the focused stare of this beautiful bird. Prints will be available soon. This entry was posted in Birds, Buy Original Artwork and tagged acrylic, acrylic on canvas, bird art, canvas, owl on September 24, 2018 by Helen Frost Rich. Wrapped up in a five-pound note. – Edward Lear. This wasn’t originally intended as an illustration for the famous children’s poem by Edward Lear. I have been working on a series of extreme close ups of animals, and this piece went so well with the tabby cat, it was only fitting that they should become a set. Happily, they have remained a set, as they were sold together. Acrylics on Canvas, 8 inches by 8 inches. Original Sold. 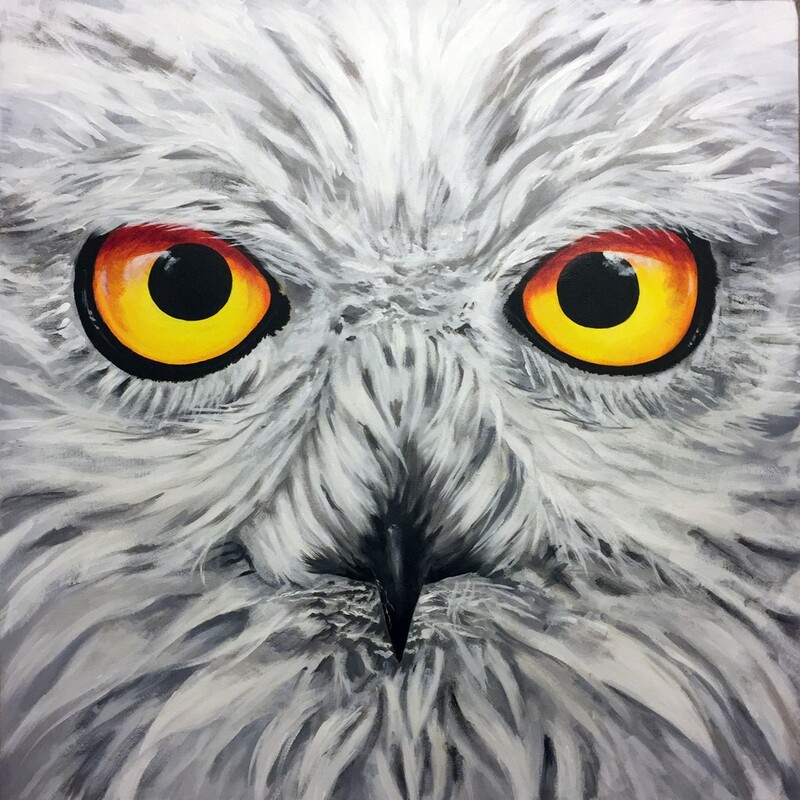 This entry was posted in Birds and tagged acrylic, acrylic on canvas, bird art, canvas, owl on September 24, 2018 by Helen Frost Rich. Eastern mythology often refers to a red string or ribbon that connects people who are fated to be together. The idea intrigues me – these threads of fate that link us all, outside our control. Ravens are associated with omens and portents. Traditionally they are birds of mystery and trickery. 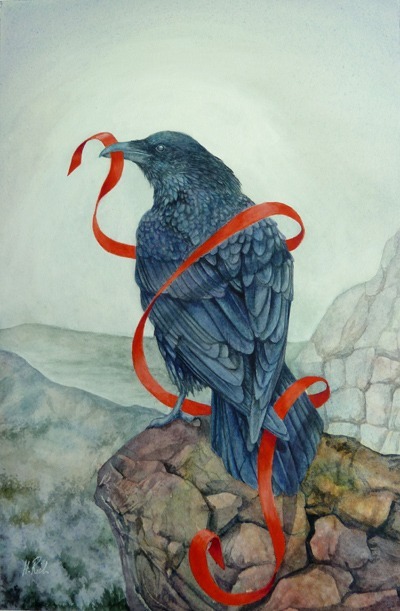 So if life ever takes an unexpected spin, maybe there’s a raven playing with your ribbon of fate. Like this? Please vote and share to let me know. This artwork is also available as a print, or on a range of designs in my store. If you would like to purchase the original painting, please contact me for more details. 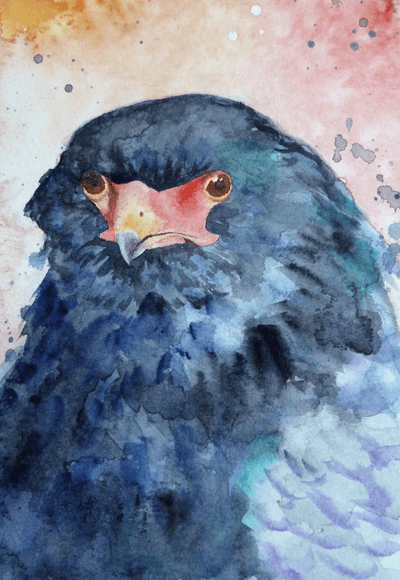 This entry was posted in Birds, Buy Original Artwork and tagged bird art, raven, watercolour on March 9, 2018 by Helen Frost Rich. 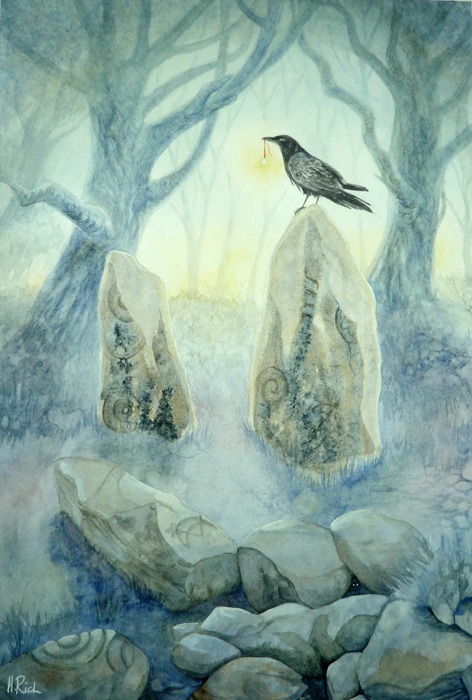 ‘A place among the stones’ was inspired by the ethereal beauty of our ancient land , and a piece of music of the same name, by the brilliant uilleann piper, Davy Spillane. This entry was posted in Birds, Buy Original Artwork and tagged bird art, raven, watercolour on February 4, 2018 by Helen Frost Rich. Storm Bringers, masters of the sky, riding the maelstrom, spreading chaos in their wake. Watercolour and Acrylic Ink. 31cmx21cm. This entry was posted in Birds, Buy Original Artwork and tagged bird art, cormorant, mixed-media, watercolour on February 2, 2018 by Helen Frost Rich. On a bright day, the blackest of shadows flutters across your vision and disappears into the deepest woodland. A raven-shaped hole in the very fabric of reality. This entry was posted in Arcadia, Birds, Buy Original Artwork and tagged bird art, raven, watercolour on January 19, 2018 by Helen Frost Rich. I dreamed of a raven with blue eyes holding a blue egg in its beak. When I woke up, I just knew I had to try to capture the ethereal, slightly otherworldy magical quality of that dream. 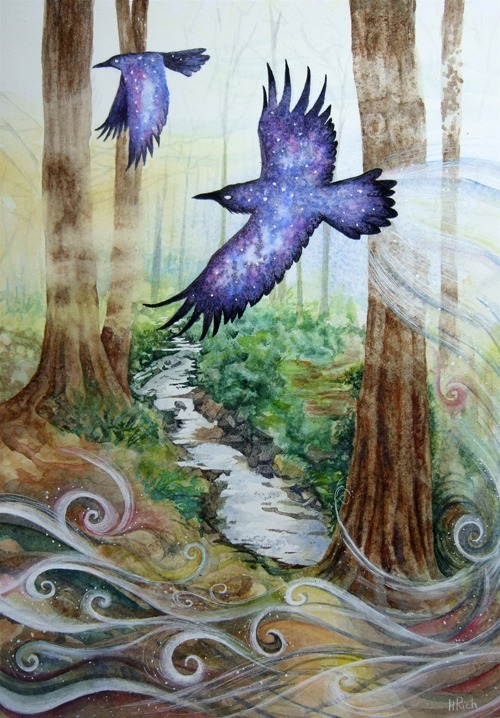 Imagine a dense forest, ancient mossy green trees, a mystical quality to the light, and the raucous call of a raven. Nothing is quite as it first appears in this place. I may visit here again. Acrylic Inks and Acrylic Gouache 24cmx34cm. 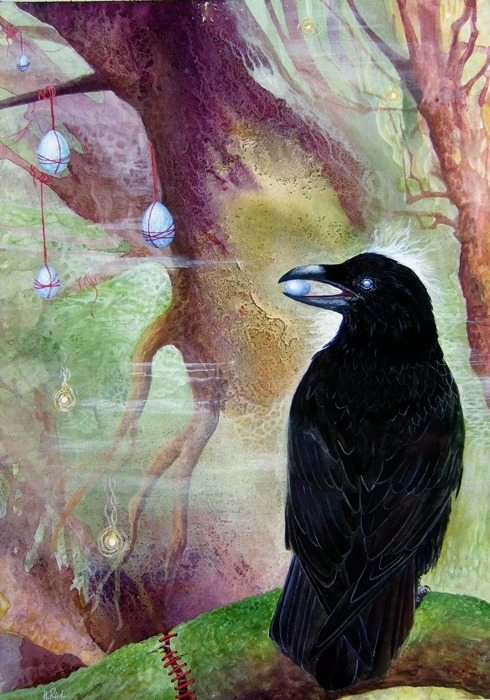 This entry was posted in Birds, Buy Original Artwork and tagged acrylic ink, bird art, dreamscape, mixed-media, raven, watercolour on September 18, 2017 by Helen Frost Rich. I often see coots near my local fishing lake. They are normally quite shy birds, so it’s always a privilege when one lets you get close. The saying ‘Bald as a coot’ refers to their young, as the chicks have a prominent pink bald patch on the top of their heads. 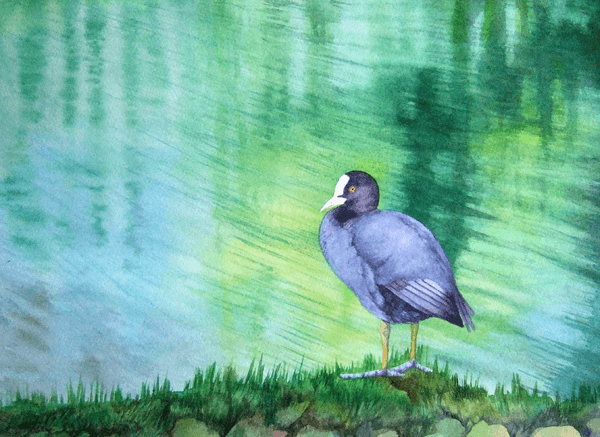 This entry was posted in Birds, Buy Original Artwork and tagged bird art, coot, watercolour on June 30, 2017 by Helen Frost Rich. This is Hector, the Bateleur Eagle. I’ve been experimenting with a looser style of painting recently. I am really enjoying the flow of colours together, without the need to add every last detail. 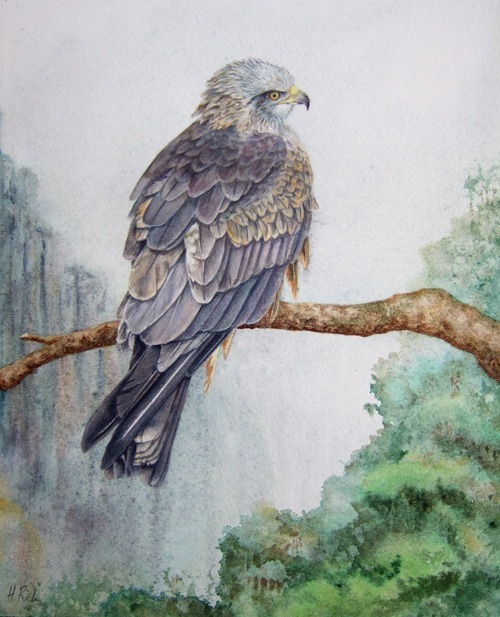 This entry was posted in Birds, Buy Original Artwork and tagged bird art, bird of prey, eagle, watercolour on June 12, 2017 by Helen Frost Rich. The beautiful Black Kite is not a native species in the UK. This is a painting of Arwen, one of the birds at Kielder Water Birds of Prey Centre, in Northumberland. Arwen is quite a character who likes to steal people’s hats and fly off with them. Many thanks to Ray and his team for letting me photograph and draw their beautiful birds. If you happen to be in the area, do go and visit. 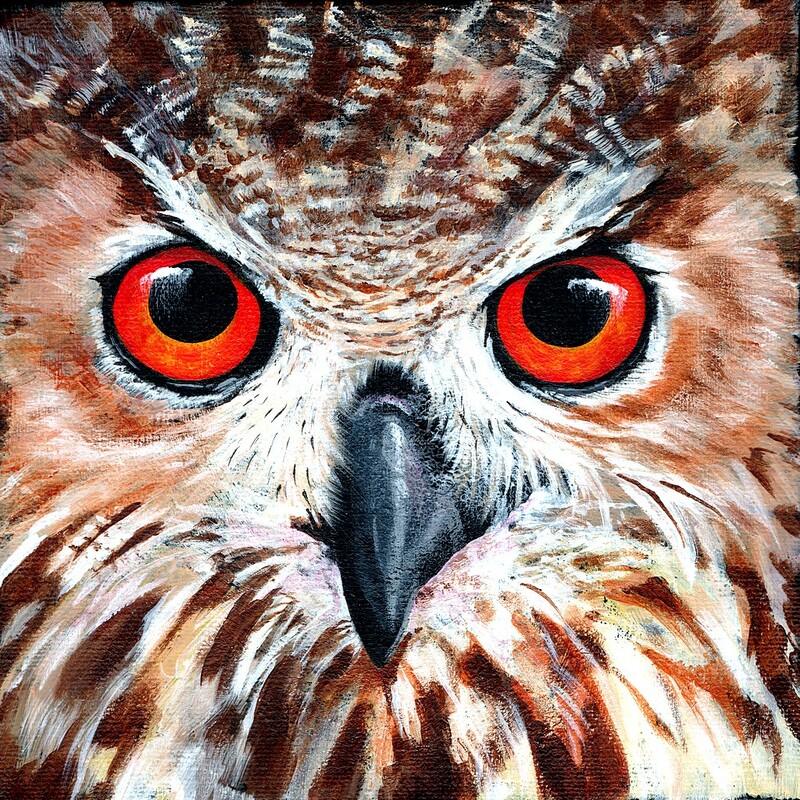 This entry was posted in Birds, Buy Original Artwork and tagged bird art, bird of prey, coloured pencils, mixed-media, watercolour on June 5, 2017 by Helen Frost Rich. A misty morning riverbank conversation between a family of Canada Geese. I wonder what they are talking about? This entry was posted in Birds, Buy Original Artwork and tagged bird art, coloured pencils, goose, mixed-media, watercolour on April 14, 2017 by Helen Frost Rich. Please check out my masquerade ball masks at Xothique Designs, too!